Chris Wilder feels he does have the necessary quality in his Cobblers squad but admits they are going through some ‘tough times’ after a fourth successive defeat on Boxing Day. Northampton were beaten 3-2 on their own ground for the second home match running, with goals from Marc Richards and Chris Hackett not enough to prevent Bury from taking all three points at Sixfields. Wilder’s side remain 19th in Sky Bet League Two and the gap to the second relegation place is still five points, although the team in that position is Tranmere, who Town play away from home in their next fixture, in two days’ time. They also finished the game with 10 men after Ivan Toney was sent off for an off-the-ball incident with Bury’s Hayden White, who also saw red. 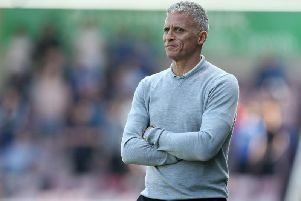 The current run is a very poor one for the Cobblers, who were again booed off by their own supporters, and Wilder is desperate to stop the rot. “These are tough times for us, it’s another loss and we can’t get away from that,” he said. “We’re in a poor run of form but we’ve got to dig in and stick together, we need to get a point from somewhere. “We started the game well but they’ve got a great equaliser and we’ve conceded another poor goal before half-time; we were chasing the game after that. “Players have got to take responsibility at set-pieces, you don’t let the player you are marking score. “It wasn’t great play from Bury, we just didn’t defend well enough from the corner. The place went flat after the second goal and I can understand that. “The results are not good enough and there is a lack of confidence in the team at the moment. We’ve got that fighting spirit in the team but we need to go and get something at Tranmere. “I believe my players are better than what they are showing at the moment. They are giving it a right go and they are fighting for each other, like they did late on today. Toney should now serve a three-game suspension for violent conduct with Wilder confirming the club are unlikely to appeal the decision to send him off.